I am Rebekah, a 42 year old mum to three boys aged 11, 9 and 7. I grew up in Sydney, spent a few years living in Melbourne after I finished school, then moved back to Sydney for a few years before finally settling in here in Peregian, near Noosa on the beautiful Sunshine Coast in Queensland. Life is always busy, as a family of five there is always somewhere to be, but it’s always an adventure. After my second baby was born 9 years ago, I started making baby bibs, shorts and softies, which I successfully sold at markets for a few years. Then when Madeit started I signed up and continued selling them online for a few more years. Two years ago I came to the conclusion that I really didn’t want to make baby bibs anymore and started my journey into Textile art. I won a couple of reasonably large competitions in that first year and was hooked. I started making baby quilts and blankets as well, then branched out into journals, cards and other items. My store is now completely unrecognisable to what it was two years ago! It was quite a large job, changing the entire structure of my business, I basically had to start again from the ground up but it has definitely been worth it. My large art quilts are now generally only made for competitions or commission, and I focus mainly on Journals, cards and small framed pieces. There are a lot of textile art competitions across Australia and across the world, and I have been reasonably successful so far. I do love making my journals though, they are so free and fun and make me happy. I also like to keep things fresh and try new things, I love learning new techniques, so there is always something new in my shop. In the last couple of weeks I have been trying some textile bowls and vases, which has been loads of fun. I am a textile Artist. I create Art Quilts, framed textile pieces, journals, cards, bags and whatever else strikes my fancy that day. I use upcycled, vintage and new fabrics and notions, and tend to buy fabrics based on colour and texture rather than pattern or print. The details in my art work are all done with the threads rather than the fabrics so the fabric is really just for background colour. I do love strong patterning on my journals though so I do also keep my eyes open for unusual or particularly bold patterns. Most of my items are quilted, so will have a front fabric, cotton or bamboo batting in the centre and a backing fabric. I also use a lot of appliqué on my journals and love adding vintage buttons, braids and ribbons for a bit of fun. My creative process is really rather haphazard, I rarely have an actual plan, but rather just decide what I want to make that day then start pulling out some random fabrics to see what will go with what. I cut my fabrics roughly without any measuring or straight lines and tend to stitch them the same way, no precise seams for me! My journals, bags and cards in particular are made very organically, I just start sewing strips of fabric together and see what happens. Once the fabric base is finished I’ll see what I can find to add to it, usually the colours will suggest something and I will add some free motion stitching, buttons etc as I feel is necessary. I guess my inspiration generally comes from the materials that I am working with, as each step in the process will suggest the next step to take. If I am making an art quilt, they are generally based on photos that I have taken in my local area. I may use a bit of one photo and a bit of another to create an entirely different scene. I roughly mark it out on the batting then layer small pieces of fabric onto this to create a background then stitch over the top to create the image. Usually there are over 20 different colours used to create an image. I tend to become fairly obsessed when making one of my landscapes, and nothing else really gets done until it is finished. My inspiration for my art quilts is all around me in the environment in which I live. We are very close to the beach and I take hundreds of photos down there at different times of day and different weather conditions. I have always crafted, as far back as I can remember I was sewing or drawing something. I started doing cross stitch when I was four or five and continued for most of my early life. My Year twelve major work was an embroidered textile piece that was selected into Art Express, a travelling exhibition of the top Year twelve major works for that year. After high school I studied a textile design course at Melbourne College of Textiles, followed by a Bachelor of Education at Melbourne University majoring in sculpture! Having decided that I absolutely didn’t want to be a teacher, I moved back to Sydney after Uni and worked at a wide range of jobs including managing a home wares store, a stint in television and then in marketing for a chain of hardware stores. It was really only when we moved up here and I started having children that I rediscovered my need to be creative for myself. I started painting and sold my paintings at markets until my second pregnancy with it’s endless morning sickness stopped that! 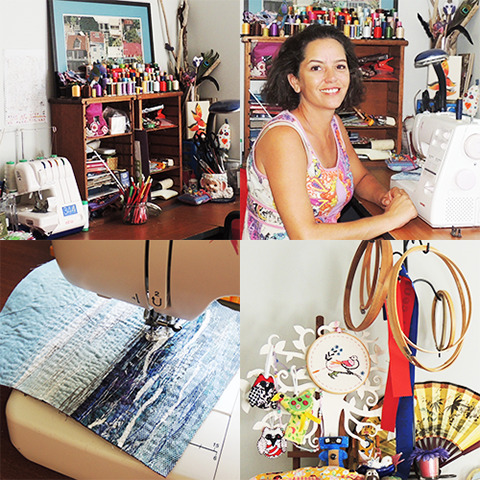 Several months later my mum gave me a sewing machine and Bekahdu started from there. My business name has actually been with me for longer than my business. It goes back to the start of the internet when I needed a username for email etc. It’s actually just a mash up of my name bekah for Rebekah plus du from Dundon. My family calls me Bekah so it just naturally evolved. I am quite old fashioned in that I don’t use many online sources for inspiration or tutorials. I still go to the library and borrow arm loads of books. I love reading beautiful art and textile books, I find them so much more real than staring at a screen, probably because I am quite a tactile person. I am also a semi regular textile magazine buyer, there are a couple of international magazines that I love (and have now recently been featured in as well). I do love Pinterest though and have been known to drool over work found on there. I am an occasional blog reader, but I don’t really have regular blogs that I follow, just what I stumble across. I try not to spend too much time on the computer, I have a set time each day and try to stick to it otherwise I might get trapped for hours. I am quite time poor, so my free school hours are very precious, and need to be spent sewing! I love finding interesting and unusual fabrics and often source these at Charity shops or online. I use a lot of Furniture upholstery sample books, these are thrown away annually by stockists and a lot end up at my local Op Shop. They are a great source of a wide range of fabric. You don’t get much of each, but that is part of the creative fun. They usually have great textures and I love that I am giving them a new life, rather than just ending up as landfill. I also buy buttons, lace and other bits and pieces from charity stores or garage sales as you can find some really unusual vintage pieces. I will use large websites such as Fabric.com from time to time, but not very often. I’m not a member of any real life groups but am in quite a few textile art groups on Facebook, which is great for motivation and exposure, as well as a bit of an ego massage every now and then. Don’t try to compete with anyone else. Do your own thing and stick with it. It will take time but gradually people will come to see who you are and what you are about. The old adage “Do what you love” is definitely true, don’t try to be someone that you are not or you will never succeed. Be creative in your advertising, use a range of methods such as Facebook, Twitter etc, but also have a regular newsletter in which you highlight particular items or sales. Each place needs a different method so you have to adapt your techniques to suit. Find what works for your target market, learn what you can about them and play to their interests. Make sure you triple check any quotes you send out so that you aren’t underselling yourself. I had a large commission last year that I seriously miscalculated and charged way too little, and it took way too long! I love going to the beach and spending time in our luscious Sunshine Coast environment with my boys. There is so much to do and see here that is easy and free, lovely walks to amazing views in particular. I also read a lot and spend a fair bit of time on my Art Journal. I walk every morning, which is my time to contemplate the day and decide what I want to sew that day. I quite often get new ideas while out walking. It is a fabulous way to clear the mind and open it up to exploring new possibilities. I listen to a huge range of music and usually have my iPod on shuffle when I’m working so classical will come up next to Black Eyed Peas, Pink then Red Hot chilli Peppers or my favourite old 90’s bands from the pub scene in Melbourne. I may be a bit stuck in the ‘90’s at times. I haven’t actually been to the movies for years unless it’s for a kid’s movie, sad I know. Favourite websites would probably be: Madeit, Pinterest, Facebook as I spend most of my time on there! Sewing all morning in a large, light perfectly set out studio with everything I need or want right to hand. Followed by lunch out somewhere beautiful, looking at a view. Then down to the beach for the afternoon with the boys, gentle waves and the water a perfect balmy temperature. ConversationsinClay - I’m loving Keryn Wells “Conversations in Clay” at the moment, fabulous colours and patterns, totally unique jewellery.